It’s known as the lifeblood of the engine. Without it, you’d be lucky to get from A to B, let alone leave your driveway. What we’re referring to of course, is motor oil. It cleans, cools, lubricates and keeps your engine running at peak performance. You’ve probably come to this article because you realize that when it comes to motor oils, synthetic oil is the best of the best. But the problem is that it can be a tough job determining which synthetic oil is truly the best. That’s where we come in. We’ve gone through dozens of products to bring you the top ten best synthetic motor oils for 2019. Here are some things you should be aware of as well as factors we’ve considered in determining our rankings. Viscosity: This refers to the oils resistance to flow and practically refers to the oil thickness. Synthetic oils have this measurement clearly stated on the bottle. For example, ’10W – 40′. The first part is the viscosity at 0 ° F (W is for winter). The second part is viscosity at 212 ° F.
Motor oil thickens as it cools and thins when it is hot. The lower the first number, the more resistant the oil is to thickening in low temperatures. On the other hand, the higher the second number, the more resistant the oil is to thinning at high temperatures. Manufacturers must strike a balance between the two as oil that is too thick can cause fuel economy issues since the fuel pump needs to work harder. Oil that is too thin won’t be stable enough to provide adequate lubrication between the moving engine parts. You’ll usually find a viscosity around 10W – 30 for many vehicles. However; this can vary quite a bit depending on the manufacturers recommendations and what the vehicle will be used for (e.g. travelling in cold weather, racing and trucking). Additives: These are substances that are added to the oil to improve it in some way. Virtually all synthetic motor oils contain additives to boost things like viscosity, increase cleaning properties and improve lifespan. Cost and Mileage: Lastly, the cost of the synthetic oil is a big factor as well as the mileage you get out of it. A sweet spot is a good synthetic oil that is relatively low in cost and can run through your car for as long as possible. Combine this property with a good oil filter and you got yourself a winning combination. Apart from these factors, we also consider things like customer satisfaction and brand reputation. It’s important to realize that some synthetic oils are general purpose, whilst others are specifically great at one thing. It’s very difficult to make a motor oil that is great at everything as usually one additive will take away the properties of another. Such is the dilemma for synthetic oil manufacturers all over the world! Despite this, virtually all synthetic oils come with anti-wear, cleaning and lubrication properties. After all, without these abilities your engine won’t be working for too long! It’s hard work to objectively judge synthetic oil. There are many tests that can be done to determine an oils effectiveness on engine economy, wear and tear, emissions, oil change intervals…the list is endless. Where one oil is good at something, it may not be good at something else. Despite this, many reviewers and customers agree that the synthetic oils provided by AMSOIL are as good as it gets. The AMSOIL signature series in particular is a class of synthetic oils that you should consider and for good reason. Independent tests have verified just how effective it is compared to most other brands out there. AMSOIL signature series synthetic oil is one of the best, if not the best, synthetic oil for protecting your engine from wear. We all know a motor oils ability to prevent wear on your engine is one of the most important factors you need to consider. From the moment you start your engine there are over a dozen moving parts which create friction between each other. You need a good motor oil to prevent the wearing out of these components as much as possible, and AMSOIL have the answer. The anti-wear additives deliver a reported 75% more engine protection than other leading brands out there. This equates to excellent fuel economy, longer oil change intervals and a stable viscosity across extreme temperatures. Astonishingly, you’ll get anywhere from 15,000 to 25,000 miles per application – a number that dwarfs many other synthetic oil brands. In terms of compatibility, you can use AMSOIL signature series with other synthetic or conventional oils, but for best results, you’re better of draining them out first. AMSOIL rose to fame in 1972 with the introduction of the first synthetic motor oil to meet the stringent requirements of the American Petroleum Institute. Since then, they’ve been a leader in the field and have continually out shined their competitors. The bottom line is you need to give this oil a try, if not for yourself, than for your vehicle. Why other review websites don’t rank this product: Interestingly, if you have a look on other websites with rankings on synthetic oils, you’ll notice AMSOIL is not mentioned. We bet it’s because those websites are affiliated with Amazon and you can’t purchase AMSOIL products through the retail giant. We like to keep things as genuine and objective as possible. Yes, we are affiliated with Amazon, but we don’t let this sway us in determining our rankings. This is a fully synthetic motor oil that your car is sure to thank you for using. Why? Well, it’s known among car enthusiasts for its amazing lubrication and cleaning abilities. It’s all thanks to the patented PurePlus technology that converts pure natural gas into full synthetic motor oil. Pennzoil’s process results in an industry leading 99.5% pure base oil. The science as to why this is better is pretty complex, but basically the purity allows additives that are added onto the base to do their job even better. The results are astonishing to say the least. Tests show that your pistons will be up to 25% cleaner than Mobil 1 synthetic oil, and 35% cleaner than similar products from Valvoline. This equates to amazing fuel economy, minimal engine energy loss and top grade protection from friction. It’s so good that Pennzoil is willing to bet you with warranty that covers up to 500,000 miles or 15 years (whichever comes first) as long as you exclusively use their synthetic oil. 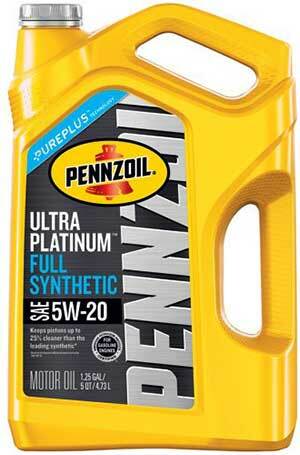 Pennzoil’s attention to purity demands that this product be at least considered. After all, if it gives your car more fuel economy, then it will also save you money. In fact, Pennzoil guarantee that you’ll get an average of 550 more miles per year out of your vehicle versus a dirty engine. Now that’s impressive. Mobile 1 has its origins from over a century ago and are one of the most popular and widely trusted brands in the automobile industry. In fact, it is the world’s leading synthetic motor oil company and used by more car manufacturers (including Porsche and Mercedes) and NASCAR teams than any other brand. You simply can’t go wrong selecting one of their many motor oil products. 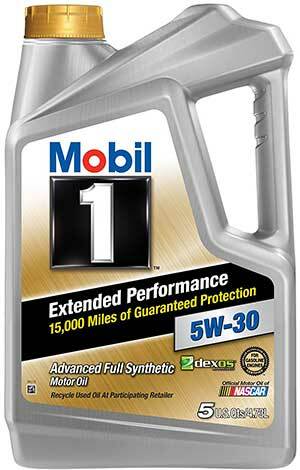 The Mobil 1 extended performance synthetic motor oil – as the name suggests – is specifically formulated for longer oil change intervals. You’ll be able to get at least 15,000 miles of use before an oil change. Mobil 1 proved this point in 2006 by getting the worlds fastest ute (HSV Z Series Maloo R8 Ute) to trek around Australia – totaling almost 23,000 miles – without an oil change. The result? The engine was found to be as clean as when the journey started. The responsibility lies with the integrated SuperSyn technology that keeps the oil anti-wear properties working at the highest level in extremely low and high temperatures. It sports a cocktail of additives that offers outstanding thermal and oxidation stability. If you need a motor oil that performs reliably in all temperature environments, then this product is a great choice. For whatever grade you need, Mobil 1 will having something for you. They have anything from 0W-20 all the way up to 10W – 30 and more. Just keep in mind that it is not recommended for 2-cycle or aviation engines. It’s not an issue unless you plan on driving a car from the 1980s when two-stroke engines were still around. And aviation engines? Well, we doubt you’re going to use this oil for anything that is going to fly. Overall, this full synthetic motor oil is very affordable, offers unparalleled longevity and is extremely reliable for everyday use. If you want to keep your vehicles engine happy, then you can’t do wrong by considering this entry from Mobil 1. Royal Purple have developed into one of the most trusted and reliable brands when it comes to auto-care. Their high performance synthetic motor oils are another top product and are a great choice when it comes to high performance vehicles. See, many synthetic oils struggle to keep shape when under the pressure of increased engines speeds, temperature and load. This leads to reduced fuel economy and degradation of the engine. This dilemma has gotten manufactures scrambling to create an oil that can hold itself under extreme environments. In comes Royal Purple’s high performance solution. And it all lies in a special additive – Synerlec – which works at the molecular level by creating high strength ionic-bonds with the metal surfaces in your engine. The oil reacts with increased viscosity, strength and lubricity, thereby keeping your engine performing at its best, even when under stress. On top of this, the oil is also compatible with conventional, blended and other synthetic oils. You can pretty much starting using it straight-away without having to drain the existing oil. However; they do recommend using it once you’ve broken in the engine at 2,000 miles or after the first oil change. If you have a high performance vehicle or live in harsh conditions, or simple put your engine under a lot of stress, this synthetic oil is for you. It’s also something you should consider even if you use your vehicle for everyday tasks. 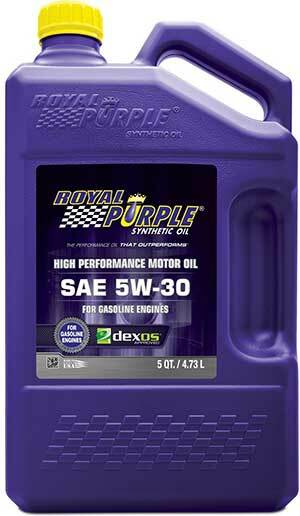 Regardless of your situation, Royal Purple offer a complete solution that will keep your engine purring as it if were brand new. Castrol EDGE is another full synthetic motor oil that – like Royal Purple’s entry – excels in keeping shape under high engine stress. 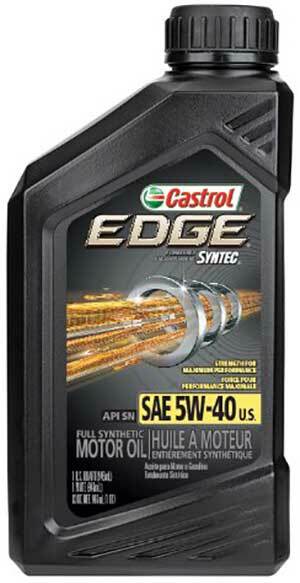 Castrol EDGE is tested to be 3 times stronger in terms of viscosity breakdown than other leading synthetic brands. The fittingly coined ‘titanium’ technology involves molecular changes to the oil which maintain its structure under high performance situations. Simply put, high friction and heat won’t cause this motor oil to lose its effectiveness. It is also reported to reduce the amount of deposits in the engine by up to 42% compared to other synthetic oils. With this synthetic oil you’ll have a product that maintains its viscosity and does an excellent job at keeping your engine clean. The team at Castrol also guarantee that you’ll be able to get 15,000 miles out of their product before you need an oil change. That doubles and even triples the typically recommended oil changes of 3,000 – 7,000 miles (depending on the vehicle). Like all the other mentions on this list, Castrol also provide multiple grades of their synthetic oil so you’ll have no issue getting the recommended viscosity for your specific vehicle. Castrol are a tried and true British company that have earned the adoration of millions of fans around the world. Their automotive lubricants are second to none, and they have proved why they are the number 1 choice for so many people. This blended synthetic oil is all about keeping your older engine running like it was brand new. In effect, the additives target the four main causes of engine breakdown – leaks, deposits, friction and sludge. The team at Valvoline recommend using this oil once your engine exceeds 75,000 miles. In specifically targeting older engines, Valvoline have created a perfect blend for the job at hand, without compromising any qualities in favor of a more general purpose synthetic oil. 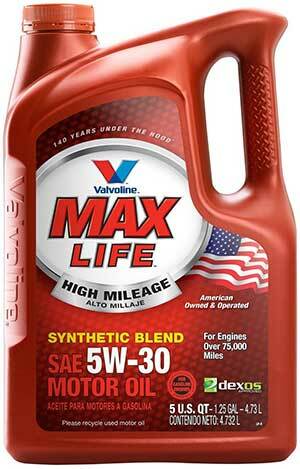 This oil has been extremely well received amongst new and older customers of the Valvoline brand. And don’t worry if your vehicle does not match the specific SAE of 5W-30, as there are multiple grades available. It’s as simple as this: If you’ve got an older engine that needs a boost, then Valvolinee MaxLife is a great choice. Ah, this list would would never be complete without at least one entry from a German company. 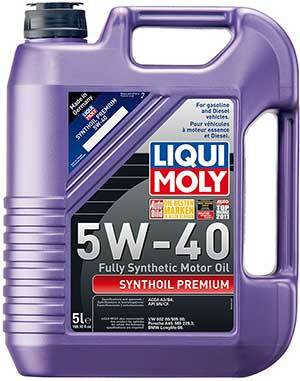 Alas, we introduce the Liqui Moly premium synthetic motor oil. When it comes to lubrication, the German boys at Liqui Moly sure know how to make an excellent product. This fully synthetic motor oil ensures speedy engine lubrication and lower fuel consumption. The big element in Liqui Moly’s success can be traced back to 1957 with the creation of the additive form of molybdenum disulphide (MoS2). The additive effectively smooths out the metal friction points throughout your engine – such as the pistons – which results in effortless lubrication and engine longevity. So much so that you can expect to get at least 15,000 miles of use out of one application. On top of this, this synthetic oil is also compatible with different engine setups including petrol, LPG engines, diesel and multi-valve arrangements. Whatever vehicles you have, Liqui Moly will have a compatible motor oil for it. 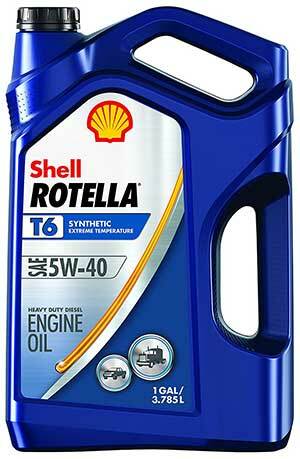 In the Shell Rotella T6 synthetic oil, we have a heavy duty solution for a heavy duty problem. This oil is a fan favorite amongst motorcyclists because of its 5W – 40 grade and exceptional performance at low and high temperatures. In fact, Shell have specifically pointed out that using this oil will enhance your vehicles fuel economy by 1.5% compared to similar grades. Shell have also included a bunch of additives to squeeze out every performance metric increase you can dream of. There are advanced multi-functional dispersant additives to provide protection against dirt, soot, debris and other contaminants. You’ll also find a low-ash additive to help lower emissions and maintain fuel efficiency. This is a robust and heavy duty oil that will keep your engine in tip top condition. Shell is one of the biggest and popular oil brands in the world and it comes as no surprise to us that they also provide one of the best synthetic oils on the market today. If you’ve got a motorcycle, you need to give this oil a try – you won’t be disapointed. 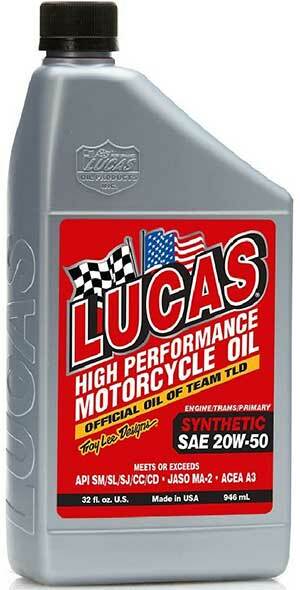 Lucas Oil is a household name when it comes to the oil of choice for ET racing. They’ve had over 100 years to perfect their high performance motor oil blend, and the results show. This is a true racing oil in that it can outlast other oils by up to 4 times. Third party tests reveal an extremely good ability at maintaining form when exposed to extreme temperatures like that experienced in a racing environment. A poorer quality oil will produce deposits leading to less efficiency and poor performance. Not Lucas Oil though. This lubricant will keep your engine parts moving effortlessly with minimal wear as well. We can thank the exclusive lubricity and anti-seize additives that protect the metal components in your engine. Yes, this oil is marketed towards racers but everyday road drivers will find something to love as well. It comes in a range of grades which are suited to all types of commuting. In any case, you’ll be able to find a grade that suits your manufacturer’s recommendations. Red Line produce a range of synthetic oils that can withstand the pressures brought about from a high performance vehicle. The biggest sell point for buying Red Line synthetic oil comes in the form of their unique polyol base stock which is reported to withstand the heat of a modern jet engine. Now, we know your vehicle won’t have something that powerful in it, but it’s assuring that this oil will be functioning at maximum ability even under extreme temperatures. Tests show that evaporation loss during high temperatures is lower than most competing brands out there. Because of it’s stable viscosity, it’ll also help reduce engine noise by up to 40%. They’ve also thrown in a high dosage of detergency additives for good measure. Red Line is a favorite amongst customers of high performance vehicles in auto and motorcycle racing. However; it is also suitable for everyday vehicles – they doesn’t discriminate. It’s really a no-brainer. 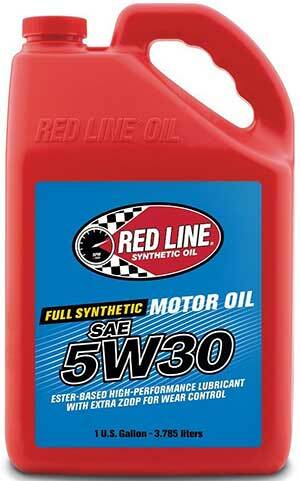 If your engine is going to run hot, you simply need to get Red Line synthetic oil. They’ve been around for almost 40 years and are a trusted brand, especially within the racing industry. If you are within this industry and haven’t tried this beast of a synthetic oil, we implore you to do so. Here is a guide to help you choose which synthetic oil is best for your car. As said earlier, most synthetic oils are good at things like lubrication and cleaning your vehicles engine. However; some should be considered over others due to their specific properties which are applicable to certain situations. Tip: The majority of brands do offer an all-round purpose synthetic motor oil which is what you should stick with if you have a vehicle that you use for general purposes. What the Heck is Synthetic Motor Oil? In case you were wondering, synthetic oil is oil that is made from a chemical process within a lab environment. Unlike conventional or blended oil, it is not derived from crude oil. Due to this process, it can be tailored to have none of the impurities (and ineffective properties) that come with crude oil. The end result? A superior motor oil for your vehicle. Manufacturers develop motor oils by using a base stock and then adding additives to produce a lubricant with certain properties. There are 5 categories of base stock according to the American Petroleum Institute. Oils from Categories I and II are derived from crude oil. Categories III to V are considered synthetic but it can be said that only IV and V are truly synthetic. More robust and will last longer in your engine. Synthetic oils typically need a change anywhere from 10,000 miles, up to 25,000 miles! Other oils usually needs a change before you hit 5,000 miles. Pretty much anything you can think that conventional or synthetic blends do, full synthetic oil does even better. For those who take car maintenance and performance seriously, you can’t skip on synthetic oil. Now that we know why synthetic oil is superior, here are things you should look out for when considering buying synthetic oil for your vehicle. If you’ve decided to take the plunge and get your first batch of synthetic oil, there are a couple of things you need to be aware of. Before switching over, check with the manufacturer as not all synthetic oils are compatible with other types of oil. If this is the case, you’ll have to drain the existing motor oil first. On the other hand, some synthetic oils are actually compatible with conventional and synthetic blends. In this case, it’s OK to add the synthetic oil with the older oil. In some other cases, manufacturers will recommend a certain engine mileage or ‘break in’ period, before switching over. Viscosity is definitely the most important criteria to consider when purchasing synthetic motor oils. As mentioned earlier, the viscosity or ‘consistency’ will vary depending on the operating temperature of your engine. Temperatures inside the engine fluctuate due to engine stress and the temperature of the outside environment. High temperature and/or high engine stress: If your vehicles engine is going to experience high temperatures, it’s a good idea to go with an oil that is thicker. The oil will start at a higher viscosity and won’t become too thin when the engine heats up further. Think of things like racing, towing on a hot day, or just driving around in very hot weather. You want something around a grade of 10W – 40. You’ll commonly find motorcycles using this grade. Typical engine stress and temperatures: For general commuting such as on paved roads in suburbs or cities you want to go with oil that is better in a more moderate environment. Something like 5W – 30 will be a good viscosity for cold, warm and hot temperature when an engine is under typical stress. Cold weather: The previously mentioned 5W – 30 is also good for cold temperatures. However; you might even go further and get something on the lines of 0W -30. You’ll notice different synthetic motor oil grades are recommended for different engines. You should read your vehicles manufacturer recommendations for the best grade of motor oil. Viscosity-index Improvers: These additives reduce the oils thinning tendencies at higher temperatures. Detergents: Oil helps clean your engine, and these detergents ensure it does a better job. For example, they help with hard to remove debris and gunk. Dispersants: This helps prevent particles from clumping together which can cause issues like sludge build up and partial blockages. Corrosion inhibitors: These help protect metal parts of the engine from corrosive elements like acid. Anti-wear agents: As the name suggests, anti-wear agents prevent the metal moving components from wearing out. A common anti-wear additive is known as zinc dialkyldithiophosphate (or ZDDP) and up until recently the exact mechanics of how it works were unknown. Antioxidants: Good for your body…and your car? It turns out motor oils use antioxidants to prevent the decay of the base oil through oxidation. Conditioners: This additive is especially more common in motor oils used for older engines. They cause old (and loose) seals to swell, thereby preventing oil leaks. Anti-foam agents: These agents help prevent the build up of bubbles and foam which can cause the oil to lose several of its properties, including the all important lubrication. You can usually find the additive information on the manufacturer’s website or booklet or on the back of the bottle. It’s the additives that cause many oils to be particularly good at one thing or another. For example, oils that are for older engines will likely have conditioner additives whilst others will contain higher detergent dosages for engine that are more prone to dirt build up (like those found in high performance vehicles). 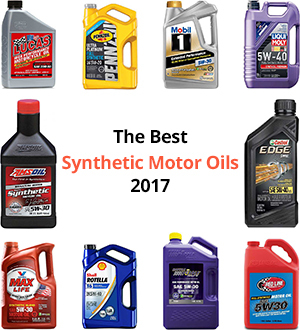 We hope you enjoyed reading our best synthetic motor oils for 2019 buyer’s guide and top ten list. Our goal is to make the whole decision process easier for you so you can make the right purchase. Have any questions or comments? Maybe there is another synthetic oil that you swear by that didn’t make it? Or maybe you had some bad experiences with some of them? Feel free to join the discussion. How did Subaru 0w20 synthetic oil rate against the rest ? I have a ’18 Outback 2.5 premium normally aspirated that calls for it. ( In My ’11 legacy 2.5 I used approved conventional 5w30 oil.) Subaru say I’ll void my warranty with anything else. I understand the 0w but I want 0w30 synthetic for hot summers.